This pancake flour contains the finest natural ingredients. The pancake flour contains no preservatives or artificial colors. Historic Stratton Flour Mill, Flushing, Ohio, produced one of the first self-rising pancake flour mixes during the 1920s, which became famous throughout the Ohio River Valley. Based on the original family formulation, which was discovered in cleaning out Stratton House following the death of the last miller, today the flour is hand mixed in small batches from selected, quality ingredients. Not only are these pancakes delicious and nutritious, they are inexpensive. 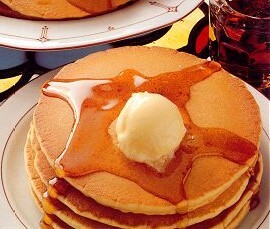 The stack of pancakes shown here can be served for as little as $0.40 per person. Add to that cost the special toppings, side dishes, and beverages of your choice. Note: The Flour does not contain powdered milk, sugar, or salt. A Self-Rising Whole Wheat Pancake Mix also is available, which does contain powdered milk, sugar, and salt. Please specify your choice when ordering.